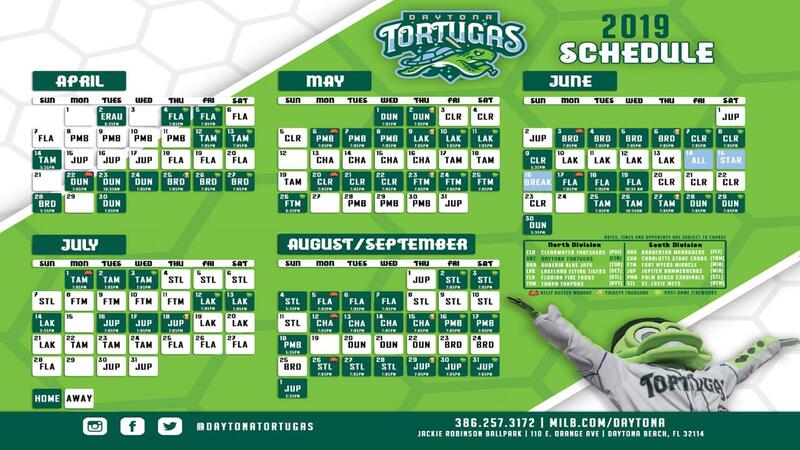 DAYTONA BEACH, Fla. - After a memorable 2018 campaign, the Daytona Tortugas are excited to announce their 2019 promotional calendar. The Tortugas have won the Larry MacPhail Promotional Award of Excellence for the Florida State League each of the past two seasons. The Tortugas have once again provided a can't-miss reason to be at the ballpark for all of the 73 home games this season. The Tortugas fifth season is highlighted by "SHELL-TASTIC SATURDAYS", five total bobblehead giveaways, 24 total fireworks shows, t-shirt giveaways every Sunday and continuing to be the "best-dressed team in baseball" every Friday Night at Jackie Robinson Ballpark. The Tortugas will be expanding upon previous years' successful Saturday promotions to incorporate all-day events and promotions on each of the 10 "Shell-tastic Saturdays" this season! These Saturdays include a total of 5 bobblehead giveaways, post-game fireworks and many large community events including Guns-n-Hoses Softball Game, Beer Fest, Daytona's Got Talent and the Copa de la Diversión Festival. Jackie Robinson Weekend (April 12-14) is highlighted by Jackie Robinson Ballpark Statue Giveaway on Saturday, April 13th to the first 1,000 fans presented by Radiology Associates Imaging. Throughout the entire weekend, all Tortugas will wear the number 9 in respect to Jackie breaking the color barrier in Daytona Beach on March 17, 1946, wearing the number 9. President Ryan Keur stated that "this is always one of the best days of the year when we get to debut our promotional calendar. We take great pride in putting on a show for our fans each night and believe that our team has once again put together some unbelievably creative and exciting reasons to visit Jackie Robinson Ballpark in 2019. Once you're here, we promise to show you an unforgettable time!" The Shell-Tastic Saturdays continue throughout the summer and feature a Tortugas-themed bobblehead of Vince Carter on Saturday, June 8th, Daytona's Got Talent promotion on July 13th in conjunction with our Shelldon-Anchorman Bobblehead and the return of Bob Ross Night on Saturday, August 17th. Fan favorites Belly Buster Monday, Taco Tuesday and Thirsty Thursday return with an expanded focus on delivering the best fan experience each night at Jackie Robinson Ballpark. Belly Buster Monday includes two different Taste of Daytona's and an expansion of the Landshark Monday Mug Club. The biggest party in town starts at Jackie Robinson Ballpark every Thursday night-with the Tortugas adding live music to the Thursday Night Entertainment Series. The Tortugas will host their Third Annual PRIDE Night celebrating the LGBTQ community on Thursday, June 27th at Jackie Robinson Ballpark during PRIDE Night. On Tuesday, April 30th, the Tortugas will host the second annual Interfaith & Community Night here at Jackie Robinson Ballpark highlighting and celebrating the religious and cultural diversity of Daytona Beach, Volusia County, and Central Florida. The Tortugas will once again take part in minor league baseball's "Es Divertido Ser Un Fan" campaign and host the "Copa de la Diversión" Nights here on Friday, June 28 thru Sunday, June 30th including a special all-day festival on Saturday, June 29th.